The long-term effects of cannabis have been the subject of ongoing debate. Because cannabis is illegal in most countries, research presents a challenge; as such, there remains much to be concluded. Acute cannabis intoxication has been shown to negatively affect attention, psychomotor task ability, and short-term memory. Studies of chronic cannabis use have not consistently demonstrated a long-lasting or refractory effect on the attention span, memory function, or cognitive abilities of moderate-dose long-term users. Once cannabis use was discontinued, these effects disappeared in users abstinent for a period of several months. Chronic use of cannabis during adolescence, a time when the brain is still developing, is correlated in the long term with lower IQ and cognitive deficits. It is not clear, though, if cannabis use causes the problems or if the causality is in the reverse. Recent studies have shown that IQ deficits existed in subjects before chronic cannabis use, suggesting that lower IQ may instead be a risk factor for cannabis addiction. Cannabis is the most widely used illicit drug in the Western world, and although in the United States 10 to 20% of consumers who use cannabis daily become dependent, it is different from addiction. Cannabis use disorder is defined in the fifth revision of the Diagnostic and Statistical Manual of Mental Disorders (DSM-5) as a condition requiring treatment. A 2012 review of cannabis use and dependency in the United States by Danovitch et al said that "42% of persons over age 12 have used cannabis at least once in their lifetime, 11.5% have used within the past year, and 1.8% have met diagnostic criteria for cannabis abuse or dependence within the past year. Among individuals who have ever used cannabis, conditional dependence (the proportion who go on to develop dependence) is 9%." Although no medication is known to be effective in combating dependency, combinations of psychotherapy such as cognitive behavioural therapy and motivational enhancement therapy have achieved some success. Cannabis dependence develops in 9% of users, significantly less than that of heroin, cocaine, alcohol, and prescribed anxiolytics, but slightly higher than that for psilocybin, mescaline, or LSD. Dependence on cannabis tends to be less severe than that observed with cocaine, opiates, and alcohol. A 2018 review of the nature of dependency on marijuana states that the risk of dependence formation among regular marijuana consumers has declined since 2002. 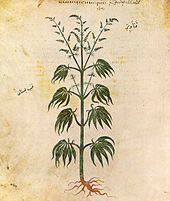 Historically, the possible connection between psychosis and cannabis has been seen as controversial. Medical evidence strongly suggests that the long-term use of cannabis by people who begin use at an early age display a higher tendency towards mental health problems and other physical and development disorders, although a causal link is not established. These risks appear to be most acute in adolescent users. Cannabis can contain over 100 different cannabinoid compounds, many of which have displayed psychoactive effects. The most distinguished cannabinoids are ∆9 – THC (THC) and cannabidiol (CBD), with THC being the primary agent responsible for the psychoactivity of cannabis. The effects of THC and CBD are salient regarding psychosis and anxiety. As of 2017 there is clear evidence that long term use of cannabis increases the risk of psychosis, regardless of confounding factors, and particularly for people who have genetic risk factors. Numerous studies have been conducted regarding anxiety and cannabis for therapeutic purposes, and these cross-sectional studies have been mostly consistent regarding the anxiolytic effects. The studies showed relief of anxiety as a result of cannabis consumption. Cannabis use may precipitate new-onset panic attacks and depersonalization/derealization symptoms simultaneously. According to one 2013 review, long term cannabis use "increases the risk of psychosis in people with certain genetic or environmental vulnerabilities", but does not cause psychosis. Important predisposing factors include genetic liability, childhood trauma and urban upbringing. Another 2013 review concluded that cannabis use may cause permanent psychological disorders in some users such as cognitive impairment, anxiety, paranoia, and increased risks of psychosis. Key predisposing variables include age of first exposure, frequency of use, the potency of the cannabis used, and individual susceptibility. A 2013 review stated that there exists "a strong association between schizophrenia and cannabis use...". The authors found that cannabis use alone does not predict the transition to subsequent psychiatric illness. Many factors are involved, including genetics, environment, time period of initiation and duration of cannabis use, underlying psychiatric pathology that preceded drug use, and combined use of other psychoactive drugs. Results are limited and inconclusive because of the small number and size of randomized controlled trials available and quality of data reporting within these trials. More research is needed to explore the effects of adjunct psychological therapy that is specifically about cannabis and psychosis as currently there is no evidence for any novel intervention being better than standard treatment, for those that both use cannabis and have schizophrenia. * At present the meaning of these scores in day-to-day care is unclear. A 2016 meta-analysis found that cannabis use increases the risk of psychosis, and that a dose–response relationship exists between the level of cannabis use and risk of psychosis. The analysis was not able to establish a causal link. Another 2016 meta-analysis found that cannabis use only predicted transition to psychosis among those who met the criteria for abuse of or dependence on the drug. A 2016 review found that the epidemiologic evidence regarding cannabis use and psychosis was strong enough "to warrant a public health message that cannabis use can increase the risk of psychotic disorders," but also cautioned that additional studies are needed to determine the size of the effect. A 2016 review said that the existing evidence did not show that cannabis caused psychosis, but rather that early or heavy cannabis use were among many factors more likely to be found in those at risk of developing psychosis. There is substantial evidence of a statistical association between cannabis use and the development of schizophrenia or other psychoses, with the highest risk among the most frequent users. Use of cannabis in adolescence or earlier is correlated with developing schizoaffective disorders in adult life, although the proportion of these cases is small. Susceptibility is most often found in users with at least one copy of the polymorphic COMT gene. Cannabis with a high THC to CBD ratio produces a higher incidence of psychological effects. CBD may show antipsychotic and neuroprotective properties, acting as an antagonist to some of the effects of THC. Studies examining this effect have used high ratios of CBD to THC, and it is unclear to what extent these laboratory studies translate to the types of cannabis used by real life users. Research has shown that CBD can safely prevent psychosis in general. Less attention has been given to the association between cannabis use and depression, though according to the Australian National Drug & Alcohol Research Center, it is possible this is because cannabis users who have depression are less likely to access treatment than those with psychosis. A 2017 review suggest that cannabis has been shown to improve the mood of depression-diagnosed patients. Teenage cannabis users show no difference from the general population in incidence of major depressive disorder (MDD), but an association exists between early exposure coupled with continued use into adult life and increased incidence of MDD in adulthood. Among cannabis users of all ages, there may be an increased risk of developing depression, with heavy users seemingly having a higher risk. A February 2019 systematic review and meta-analysis found that cannabis consumption during adolescence was associated with an increased risk of developing depression and suicidal behavior later in life, while finding no effect on anxiety. Among those who have been previously diagnosed with bipolar disorder, cannabis may worsen the occurrence of manic symptoms. Adolescent cannabis users show no difference from their peers in suicidal ideation or rate of suicide attempts, but those who continue to use cannabis into adult life exhibit an increased incidence of both, although multiple other contributory factors are also implicated. In the general population a weak (indirect) association appears to exist between suicidal behaviour and cannabis consumption in both psychotic and non-psychotic users, although it remains unclear whether regular cannabis use increases the risk of suicide. Cannabis use is a risk factor in suicidality, but suicide attempts are characterized by many additional risk factors including mood disorders, stress, personal problems and poor support. The gateway drug hypothesis asserts that the use of soft drugs such as cannabis, tobacco or alcohol may ultimately lead to the use of harder drugs. Whether the role of cannabis in other drug use is causative or simply the result of the same influencing factors of drug use in general is debated. Large-scale longitudinal studies in the UK and New Zealand from 2015 and 2017 showed an association between cannabis use and an increased probability of later disorders in the use of other drugs. A 2013 literature review said that exposure to cannabis was "associated with diseases of the liver (particularly with co-existing hepatitis C), lungs, heart, and vasculature". The authors cautioned that "evidence is needed, and further research should be considered, to prove causal associations of marijuana with many physical health conditions". Imaging studies suggest that long-term exposure does not lead to decreases in white matter or grey matter volume, but may lead to reductions in hippocampal volume. Variations in the methodologies used lend some uncertainty to this conclusion. The acute effects of cannabis use in humans include a dose-dependent increase in heart rate, typically accompanied by a mild increase in blood pressure while lying down and postural hypotension - a drop in blood pressure when standing up. These effects may vary depending on the relative concentration of the many different cannabinoids that can affect the cardiovascular function, such as cannabigerol. Smoking cannabis decreases exercise tolerance. Cardiovascular effects may not lead to serious health issues for the majority of young, healthy users; on the contrary, heart attack, that is myocardial infarction, stroke, and other adverse cardiovascular events, have occurred in association with its use. Cannabis use by people with cardiovascular disease poses a health risk because it can lead to increased cardiac work, increased catecholamine levels, and impaired blood oxygen carrying capacity due to the production of carboxyhemoglobin. A 2012 review examining the relation of cancer and cannabis found little direct evidence that cannabinoids found in cannabis, including THC, are carcinogenic. Cannabinoids are not mutagenic according to the Ames test. However, cannabis smoke has been found to be carcinogenic in rodents and mutagenic in the Ames test. Correlating cannabis use with the development of human cancers has been problematic due to difficulties in quantifying cannabis use, unmeasured confounders, and that cannabinoids may have anti-cancer effects. According to a 2013 literature review, cannabis could be carcinogenic, but there are methodological limitations in studies making it difficult to establish a link between cannabis use and cancer risk. The authors say that bladder cancer does seem to be linked to habitual cannabis use, and that there may be a risk for cancers of the head and neck among long-term (more than 20 years) users. Gordon and colleagues said, "there does appear to be an increased risk of cancer (particularly head and neck, lung, and bladder cancer) for those who use marijuana over a period of time, although what length of time that this risk increases is uncertain." According to Gordon and colleagues, "several recent studies suggest an association between marijuana use and testicular germ cell tumors". There have been a limited number of studies that have looked at the effects of smoking cannabis on the respiratory system. Chronic heavy cannabis smoking is associated with coughing, production of sputum, wheezing, and other symptoms of chronic bronchitis. Regular cannabis use has not been shown to cause significant abnormalities in lung function. Regular cannabis smokers show pathological changes in lung cells similar to those that precede the development of lung cancer in tobacco smokers. Gordon and colleagues in a 2013 literature review said: "Unfortunately, methodological limitations in many of the reviewed studies, including selection bias, small sample size, limited generalizability, and lack of adjustment for tobacco smoking, may limit the ability to attribute cancer risk solely to marijuana use." Reviewing studies adjusted for age and tobacco use, they said there was a risk of lung cancer even after adjusting for tobacco use, but that the period of time over which the risk increases is uncertain. A 2013 review which specifically examined the effects of cannabis on the lung concluded "[f]indings from a limited number of well-designed epidemiological studies do not suggest an increased risk for the development of either lung or upper airway cancer from light or moderate use, although evidence is mixed concerning possible carcinogenic risks of heavy, long-term use." In 2013 the International Lung Cancer Consortium found no significant additional lung cancer risk in tobacco users who also smoked cannabis. Nor did they find an increased risk in cannabis smokers who did not use tobacco. They concluded that "[o]ur pooled results showed no significant association between the intensity, duration, or cumulative consumption of cannabis smoke and the risk of lung cancer overall or in never smokers." They cautioned that "[o]ur results cannot preclude the possibility that cannabis may exhibit an association with lung cancer risk at extremely high dosage." Cannabis smoke contains thousands of organic and inorganic chemicals, including many of the same carcinogens as tobacco smoke. A 2012 special report by the British Lung Foundation concluded that cannabis smoking was linked to many adverse effects, including bronchitis and lung cancer. They identified cannabis smoke as a carcinogen and also said awareness of the danger was low compared with the high awareness of the dangers of smoking tobacco particularly among younger users. They said there was an increased risk from each cannabis cigarette due to drawing in large puffs of smoke and holding them. Cannabis smoke has been listed on the California Proposition 65 warning list as a carcinogen since 2009, but leaves and pure THC are not. A 2011 review of studies in the United States found that although some supported the hypothesis that cannabis use increased the risk of getting head and neck cancer, when other factors are accounted for the majority did not. Gordon and colleagues (2013) said there was a risk of these cancers associated with cannabis use over a long period of time. A 2015 review found no association with lifetime cannabis use and the development of head and neck cancer. A 2013 literature review by Gordon and colleagues concluded that inhaled cannabis is associated with lung disease, although Tashkin's 2013 review has found "no clear link to chronic obstructive pulmonary disease". Of the various methods of cannabis consumption, smoking is considered the most harmful; the inhalation of smoke from organic materials can cause various health problems (e.g., coughing and sputum). Isoprenes help to modulate and slow down reaction rates, contributing to the significantly differing qualities of partial combustion products from various sources. Smoking cannabis has been linked to adverse respiratory effects including: chronic coughing, wheezing, sputum production, and acute bronchitis. It has been suggested that the common practice of inhaling cannabis smoke deeply and holding breath could lead to pneumothorax. In a few case reports involving immunocompromised patients, pulmonary infections such as aspergillosis have been attributed to smoking cannabis contaminated with fungi. The transmission of tuberculosis has been linked to cannabis inhalation techniques, such as sharing water pipes and 'Hotboxing'. A study released by the National Academies of Sciences, Engineering, and Medicine cited significant evidence for a statistical link between mothers who smoke cannabis during pregnancy and lower birth weights of their babies. Cannabis consumption in pregnancy is associated with restrictions in growth of the fetus, miscarriage, and cognitive deficits in offspring. Although the majority of research has concentrated on the adverse effects of alcohol, there is now evidence that prenatal exposure to cannabis has serious effects on the developing brain and is associated with "deficits in language, attention, areas of cognitive performance, and delinquent behavior in adolescence". A report prepared for the Australian National Council on Drugs concluded cannabis and other cannabinoids are contraindicated in pregnancy as it may interact with the endocannabinoid system. No fatal overdoses associated with cannabis use have ever been reported. Due to the small number of studies that have been conducted, the evidence is insufficient to show a long-term elevated risk of mortality from any cause. Motor vehicle accidents, suicide, and possible respiratory and brain cancers are all of interest to many researchers, but no studies have been able to show a consistent increase in mortality from these causes. ^ "Medical Marijuana Policy in the United States". Stanford.edu. 2012-05-15. Retrieved 2013-01-15. ^ Andrade, C (May 2016). "Cannabis and neuropsychiatry, 1: benefits and risks". The Journal of Clinical Psychiatry. 77 (5): e551–4. doi:10.4088/JCP.16f10841. PMID 27249079. ^ Sagie S, Eliasi Y, Livneh I, Bart Y, Monovich E (2013). "[Short-and long-term effects of cannabinoids on memory, cognition and mental illness]". Harefuah (Review) (in Hebrew). 152 (12): 737–41, 751. PMID 24483000. ^ Schoeler, T; Bhattacharyya, S (2013). "The effect of cannabis use on memory function: an update". Substance Abuse and Rehabilitation. 4: 11–27. doi:10.2147/SAR.S25869. PMC 3931635. PMID 24648785. ^ Zehra A, Burns J, Liu CK, Manza P, Wiers CE, Volkow ND, et al. (2018). "Cannabis Addiction and the Brain: a Review". J Neuroimmune Pharmacol. 13 (4): 438–452. doi:10.1007/s11481-018-9782-9. PMC 6223748. PMID 29556883. ^ a b c d e f g h i j k Gordon AJ, Conley JW, Gordon JM (December 2013). "Medical consequences of marijuana use: a review of current literature". Curr Psychiatry Rep (Review). 15 (12): 419. doi:10.1007/s11920-013-0419-7. PMID 24234874. ^ Borgelt LM, Franson KL, Nussbaum AM, Wang GS (February 2013). "The pharmacologic and clinical effects of medical cannabis". Pharmacotherapy (Review). 33 (2): 195–209. CiteSeerX 10.1.1.1017.1935. doi:10.1002/phar.1187. PMID 23386598. ^ Danovitch I, Gorelick DA (June 2012). "State of the art treatments for cannabis dependence". Psychiatr. Clin. North Am. (Review). 35 (2): 309–26. doi:10.1016/j.psc.2012.03.003. PMC 3371269. PMID 22640758. ^ Wilkie G, Sakr B, Rizack T (March 2016). "Medical Marijuana Use in Oncology: A Review". JAMA Oncology. 2 (5): 670. doi:10.1001/jamaoncol.2016.0155. PMID 26986677. ^ Budney AJ, Roffman R, Stephens RS, Walker D (December 2007). "Marijuana dependence and its treatment". Addict Sci Clin Pract (Review). 4 (1): 4–16. doi:10.1151/ASCP07414. PMC 2797098. PMID 18292704. ^ Davenport, Steven (2018-10-01). "Falling rates of marijuana dependence among heavy users". Drug and Alcohol Dependence. 191: 52–55. doi:10.1016/j.drugalcdep.2018.06.025. ISSN 0376-8716. PMID 30077891. ^ a b Walsh, Z; Gonzalez, R; Crosby, K; S Thiessen, M; Carroll, C; Bonn-Miller, MO (February 2017). "Medical cannabis and mental health: A guided systematic review". Clinical Psychology Review. 51: 15–29. doi:10.1016/j.cpr.2016.10.002. PMID 27816801. ^ a b Parakh P, Basu D (2013). "Cannabis and psychosis: have we found the missing links?". Asian J Psychiatr (Review). 6 (4): 281–7. doi:10.1016/j.ajp.2013.03.012. PMID 23810133. ^ a b Hoch E, Bonnetn U, Thomasius R, Ganzer F, Havemann-Reinecke U, Preuss UW (2015). "Risks associated with the non-medicinal use of cannabis". Dtsch Arztebl Int (Review). 112 (16): 271–8. doi:10.3238/arztebl.2015.0271. PMC 4442549. PMID 25939318. ^ Schier, Alexandre Rafael de Mello; Ribeiro, Natalia Pinho de Oliveira; e Silva, Adriana Cardoso de Oliveira; Hallak, Jaime Eduardo Cecilio; Crippa, José Alexandre S.; Nardi, Antonio E.; Zuardi, Antonio Waldo (June 2012). "Cannabidiol, a Cannabis sativa constituent, as an anxiolytic drug". Revista Brasileira de Psiquiatria. 34: S104–S117. doi:10.1590/s1516-44462012000500008. ISSN 1516-4446. ^ Walsh, Zach; Gonzalez, Raul; Crosby, Kim; S. Thiessen, Michelle; Carroll, Chris; Bonn-Miller, Marcel O. (2017-02-01). "Medical cannabis and mental health: A guided systematic review". Clinical Psychology Review. 51: 15–29. doi:10.1016/j.cpr.2016.10.002. ISSN 0272-7358. ^ Crippa, José Alexandre; Zuardi, Antonio Waldo; Martín-Santos, Rocio; Bhattacharyya, Sagnik; Atakan, Zerrin; McGuire, Philip; Fusar-Poli, Paolo (October 2009). "Cannabis and anxiety: a critical review of the evidence". Human Psychopharmacology: Clinical and Experimental. 24 (7): 515–523. doi:10.1002/hup.1048. ISSN 0885-6222. ^ Steenkamp, MM; Blessing, EM; Galatzer-Levy, IR; Hollahan, LC; Anderson, WT (March 2017). "Marijuana and other cannabinoids as a treatment for posttraumatic stress disorder: A literature review". Depression and Anxiety. 34 (3): 207–216. doi:10.1002/da.22596. PMID 28245077. ^ Bonn-Miller, Marcel O.; Babson, Kimberly A.; Vandrey, Ryan (March 2014). "Using cannabis to help you sleep: Heightened frequency of medical cannabis use among those with PTSD". Drug and Alcohol Dependence. 136: 162–165. doi:10.1016/j.drugalcdep.2013.12.008. ISSN 0376-8716. PMC 3929256. ^ Diagnostic and statistical manual of mental disorders : DSM-5. (Fifth edition. ed.). American Psychiatric Association. 2013. p. 304. ^ a b Niesink, RJ; van Laar, MW (2013). "Does Cannabidiol Protect Against Adverse Psychological Effects of THC?". Frontiers in Psychiatry (Review). 4: 130. doi:10.3389/fpsyt.2013.00130. PMC 3797438. PMID 24137134. ^ Chadwick, B.; Miller, M. L.; Hurd, Y. L. (2013). "Cannabis Use during Adolescent Development: Susceptibility to Psychiatric Illness". Frontiers in Psychiatry. 4: 129. doi:10.3389/fpsyt.2013.00129. PMC 3796318. PMID 24133461. ^ van Winkel, Ruud; Kuepper, Rebecca (28 March 2014). "Epidemiological, Neurobiological, and Genetic Clues to the Mechanisms Linking Cannabis Use to Risk for Nonaffective Psychosis". Annual Review of Clinical Psychology. 10 (1): 767–791. doi:10.1146/annurev-clinpsy-032813-153631. PMID 24471373. ^ a b McLoughlin, B; Pushpa-Rajah, J; Gillies, D (2014). "Cannabis and schizophrenia". Cochrane Database of Systematic Reviews. 10 (2): 336–337. doi:10.1002/14651858.CD004837.pub3. PMC 4332954. PMID 25552590. ^ Marconi, A; Di Forti, M; Lewis, CM; Murray, RM; Vassos, E (15 February 2016). "Meta-analysis of the Association Between the Level of Cannabis Use and Risk of Psychosis". Schizophrenia Bulletin. 42 (5): 1262–1269. doi:10.1093/schbul/sbw003. PMC 4988731. PMID 26884547. ^ Kraan, T; Velthorst, E; Koenders, L; Zwaart, K; Ising, HK; van den Berg, D; de Haan, L; van der Gaag, M (March 2016). "Cannabis use and transition to psychosis in individuals at ultra-high risk: review and meta-analysis". Psychological Medicine. 46 (4): 673–81. doi:10.1017/S0033291715002329. PMID 26568030. ^ Gage, SH; Hickman, M; Zammit, S (1 April 2016). "Association Between Cannabis and Psychosis: Epidemiologic Evidence". Biological Psychiatry. 79 (7): 549–56. doi:10.1016/j.biopsych.2015.08.001. PMID 26386480. ^ Ksir C, Hart CL (2016). "Cannabis and Psychosis: a Critical Overview of the Relationship". Curr Psychiatry Rep (Review). 18 (2): 12. doi:10.1007/s11920-015-0657-y. PMID 26781550. our review of the evidence leads us to conclude that both early use of cannabis and heavy use of cannabis are more likely in individuals with a vulnerability to a variety of other problem behaviors, such as early or heavy use of cigarettes or alcohol, use of other illicit drugs, and poor school performance. ^ a b "The Health Effects of Cannabis and Cannabinoids: The Current State of Evidence and Recommendations for Research : Health and Medicine Division". nationalacademies.org. Retrieved 2017-02-19. ^ a b c Chadwick, Benjamin; Miller, Michael L; Hurd, Yasmin L (2013). "Cannabis Use during Adolescent Development: Susceptibility to Psychiatric Illness". Frontiers in Psychiatry (Review). 4: 129. doi:10.3389/fpsyt.2013.00129. PMC 3796318. PMID 24133461. ^ Scuderi, C; Filippis, DD; Iuvone, T; Blasio, A; Steardo, A; Esposito, G (May 2009). "Cannabidiol in medicine: a review of its therapeutic potential in CNS disorders". Phytotherapy Research (Review). 23 (5): 597–602. doi:10.1002/ptr.2625. PMID 18844286. ^ Zuardi, AW; Crippa, JA; Hallak, JE; Bhattacharyya, S; Atakan, Z; Martin-Santos, R; McGuire, PK; Guimarães, FS (2012). "A critical review of the antipsychotic effects of cannabidiol: 30 years of a translational investigation". Current Pharmaceutical Design. 18 (32): 5131–40. doi:10.2174/138161212802884681. PMID 22716160. ^ Lev-Ran S, Roerecke M, Le Foll B, et al. (June 2013). "The association between cannabis use and depression: a systematic review and meta-analysis of longitudinal studies". Psychological Medicine (Review). 44 (24): 797–810. doi:10.1017/S0033291713001438. PMID 23795762. ^ Gobbi, Gabriella; Atkin, Tobias; Zytynski, Tomasz; Wang, Shouao; Askari, Sorayya; Boruff, Jill; Ware, Mark; Marmorstein, Naomi; Cipriani, Andrea; Dendukuri, Nandini; Mayo, Nancy (13 February 2019). "Cannabis Use in Adolescence and Risk of Depression, Anxiety, and Suicidality in Young Adulthood". JAMA Psychiatry. doi:10.1001/jamapsychiatry.2018.4500. PMID 30758486. Retrieved 13 February 2019. ^ Gibbs, Melanie; Winsper, Catherine; Marwaha, Steven; Gilbert, Eleanor; Broome, Matthew; Singh, Swaran P. (January 2015). "Cannabis use and mania symptoms: A systematic review and meta-analysis". Journal of Affective Disorders. 171: 39–47. doi:10.1016/j.jad.2014.09.016. PMID 25285897. ^ a b Serafini G, Pompili M, Innamorati M, et al. (2012). "Can cannabis increase the suicide risk in psychosis? A critical review". Current Pharmaceutical Design (Review). 18 (32): 5165–87. doi:10.2174/138161212802884663. PMID 22716157. ^ a b c Calabria B, Degenhardt L, Hall W, Lynskey M (May 2010). "Does cannabis use increase the risk of death? Systematic review of epidemiological evidence on adverse effects of cannabis use". Drug Alcohol Rev (Review). 29 (3): 318–30. doi:10.1111/j.1465-3362.2009.00149.x. PMID 20565525. ^ Courtney KE, Mejia MH, Jacobus J (2017). "Longitudinal Studies on the Etiology of Cannabis Use Disorder: A Review". Current Addiction Reports. 4 (2): 43–52. doi:10.1007/s40429-017-0133-3. PMC 5644349. PMID 29057198. ^ Badiani A, Boden JM, De Pirro S, Fergusson DM, Horwood LJ, Harold GT (2015). "Tobacco smoking and cannabis use in a longitudinal birth cohort: evidence of reciprocal causal relationships". Drug and Alcohol Dependence. 150: 69–76. doi:10.1016/j.drugalcdep.2015.02.015. PMID 25759089. ^ Taylor M, Collin SM, Munafò MR, MacLeod J, Hickman M, Heron J (2017). "Patterns of cannabis use during adolescence and their association with harmful substance use behaviour: findings from a UK birth cohort". Journal of Epidemiology and Community Health. 71 (8): 764–770. doi:10.1136/jech-2016-208503. PMC 5537531. PMID 28592420. ^ Rocchetti, M; Crescini, A; Borgwardt, S; Caverzasi, E; Politi, P; Atakan, Z; Fusar-Poli, P (2013). "Is cannabis neurotoxic for the healthy brain? A meta-analytical review of structural brain alterations in non-psychotic users". Psychiatry and Clinical Neurosciences. 67 (7): 483–92. doi:10.1111/pcn.12085. PMID 24118193. ^ J Clin Pharmacol. 2002 Nov;42(11 Suppl):58S-63S. Cardiovascular system effects of marijuana. Jones RT. ^ Stephen Maisto; Mark Galizio; Gerard Connors (2014). Drug Use and Abuse. Cengage Learning. p. 278. ISBN 978-1-305-17759-8. ^ W. Hall; N. Solowij (1998-11-14). "Adverse effects of cannabis". Lancet. 352 (9140): 1611–16. doi:10.1016/S0140-6736(98)05021-1. PMID 9843121. ^ a b c Tashkin, DP (June 2013). "Effects of marijuana smoking on the lung". Annals of the American Thoracic Society. 10 (3): 239–47. doi:10.1513/annalsats.201212-127fr. PMID 23802821. ^ Hall W, Degenhardt L (2009). "Adverse health effects of non-medical cannabis use". Lancet. 374 (9698): 1383–91. doi:10.1016/S0140-6736(09)61037-0. PMID 19837255. ^ Zhang R, Zuo-Feng Z, Morgenstern H, et al. (15 February 2015). "Cannabis smoking and lung cancer risk: Pooled analysis in the International Lung Cancer Consortium". International Journal of Cancer. 136 (4): 894–903. doi:10.1002/ijc.29036. PMC 4262725. PMID 24947688. ^ Hashibe M, Ford DE, Zhang ZF (November 2002). "Marijuana smoking and head and neck cancer". J Clin Pharmacol (Review). 42 (11 Suppl): 103S–107S. doi:10.1002/j.1552-4604.2002.tb06010.x. PMID 12412843. ^ a b c "The impact of cannabis on your lungs". British Lung Association. June 2012. Archived from the original on 2013-09-27. Retrieved 2013-01-09. ^ de Carvalho, MF; Dourado, MR; Fernandes, IB; Araújo, CT; Mesquita, AT; Ramos-Jorge, ML (15 September 2015). "Head and neck cancer among marijuana users: A meta-analysis of matched case-control studies". Archives of Oral Biology. 60 (12): 1750–1755. doi:10.1016/j.archoralbio.2015.09.009. PMID 26433192. ^ [non-primary source needed] [needs update] Grotenhermen, F. (2001). "Harm Reduction Associated with Inhalation and Oral Administration of Cannabis and THC". Journal of Cannabis Therapeutics. 1 (3–4): 133–152. doi:10.1300/J175v01n03_09. ^ Tashkin DP (June 2005). "Smoked marijuana as a cause of lung injury". Monaldi Arch Chest Dis (Review). 63 (2): 93–100. doi:10.4081/monaldi.2005.645. PMID 16128224. ^ Lutchmansingh, D; Pawar, L; Savici, D (2014). "Legalizing Cannabis: A physician's primer on the pulmonary effects of marijuana". Current Respiratory Care Reports. 3 (4): 200–205. doi:10.1007/s13665-014-0093-1. PMC 4226845. PMID 25401045. ^ Fonseca BM, Correia-da-Silva G, Almada M, Costa MA, Teixeira NA (2013). "The Endocannabinoid System in the Postimplantation Period: A Role during Decidualization and Placentation". Int J Endocrinol (Review). 2013: 1–11. doi:10.1155/2013/510540. PMC 3818851. PMID 24228028. In fact, maternal marijuana use has been associated with foetal growth restrictions, spontaneous miscarriage, and cognitive deficits in infancy and adolescence. ^ Irner TB (2012). "Substance exposure in utero and developmental consequences in adolescence: a systematic review". Child Neuropsychol (Review). 18 (6): 521–49. doi:10.1080/09297049.2011.628309. PMID 22114955. This page was last edited on 10 April 2019, at 19:12 (UTC).